Throughout my time at Junto, I've facilitated, attended, and participated in dozens of sessions where job descriptions were a topic of discussion. As an outcome, I have come to believe that job descriptions have two main functions. Advertise the company and role to candidates. This helps the company attract the right person. Outline the core activities and areas of ownership that the future team member will be held accountable for. This helps create the starting point for a clear training and performance management process. A number of companies (both Alumni and those run by Mentors in Junto) have their vision, mission and values statements front and center on job descriptions. Candidates who are interested purely in the role but don’t align with the company have an opportunity to immediately opt out. Those who love the company’s strategic direction are only more energized to apply. Check out Spikeball’s (JuntoII) career page. Before you click a job description link to see the specifics of any role, they have these two paragraphs describing what a perfect member of their team is and is not. 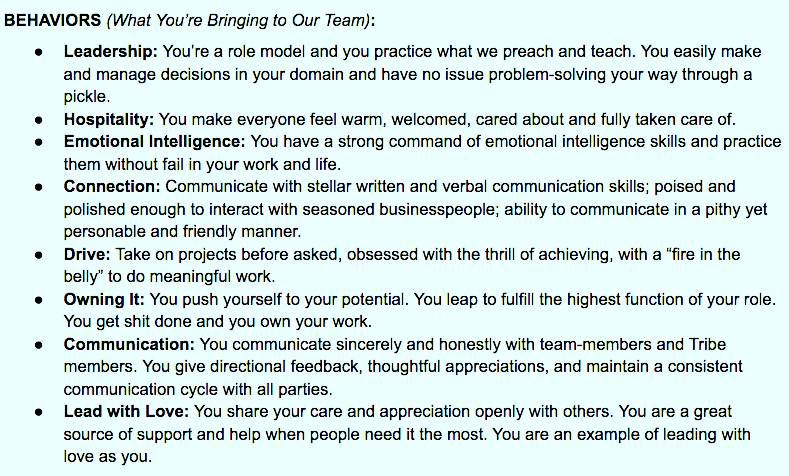 On job descriptions for our business, we include a list of “Behaviors” of an ideal candidate. This highly important yet playful list attracts ideal candidates who have often said, “This is SO ME!” by the end of the list (just ask Samantha Mikos, who joined our team five months ago, how she reacted after reading the descriptions for the role she now has!). My overall lesson learned here is that job descriptions are a form of advertising that help bring in the perfect candidate. Just as much as we want to get the right person saying “Hell yes!”, we want to get the wrong person saying "No thanks”. The second function of clearly outlining the role’s activities and areas of ownership helps candidates understand what they will be held accountable for, and is a launching point for building their training process. One of our Class Mentors is Adam Robinson, CEO of Hireology. 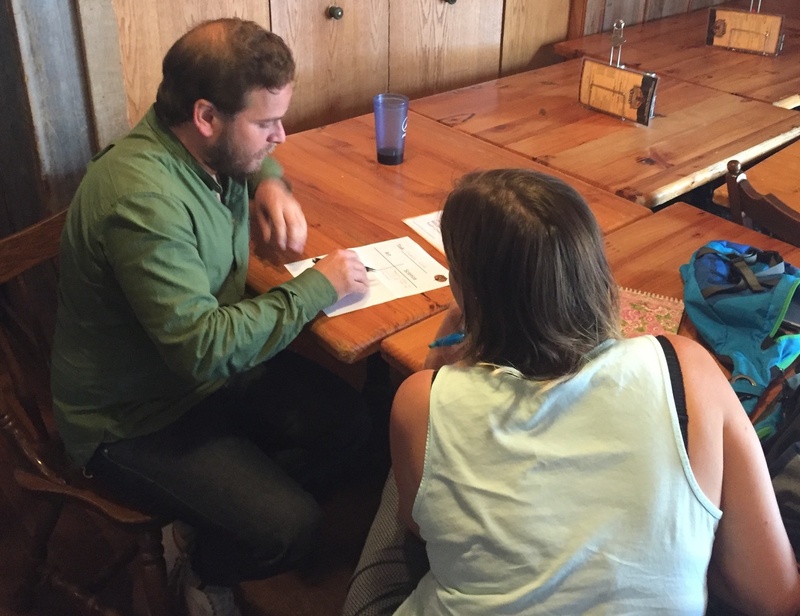 In our Hiring, Managing and Firing class, Adam said that Hireology creates job profiles for each of their new roles and new hires. These profiles tie back to the core functions of the role outlined in the job description and flush out where the new hire should be at three months, six months and one year. He outlines this process in detail in his new book, The Best Team Wins. For our team, we have created role descriptions for each person, including the founders. The activities listed in the description are broken down by the core functions of the business that the specific role owns or supports. For new members of our team, we create a work plan (inspired by Adam's job profiles) that breaks down the progress towards the role functions into 30, 60, 90, 180 day and one-year increments. Once a member of the team is fully onboarded, we continue team training and performance management by highlighting 3-5 activities from their job description as short-term priorities. Every two weeks, we then have one-on-one check-ins to discuss how the ownership of the activity is going. The team member drives this conversation, and through reflection on the prioritized activities, shares where things moved forward last week and where he / she needs to focus this week. My lesson learned here is that, when writing a job description, it helps to have a longer term view: consider if the activities being documented can be used in the onboarding and performance tracking process. Overall, I’ve learned that time and work can be saved when job descriptions are used for the dual function of attracting and informing the best candidates, and then guiding the training and tracking of the newly hired team member.